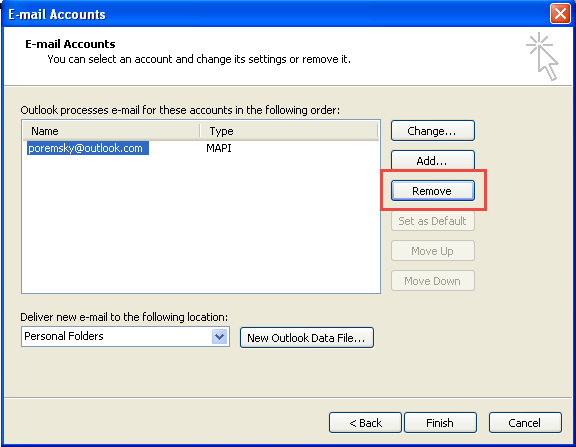 In Outlook 2010, you can remove the Outlook Connector account from File, Account settings , however, in Outlook 2007, you can’t add the new account while Outlook is open and need to close Outlook and open the Control Panel, find Mail then remove the account and add it back. You can use this same method for Outlook 2010 as well. After opening Mail, click Email Accounts. Select the Connector account (the account type is MAPI) and click Remove. If you don’t have another email account or a pst in your profile, you’ll need to add a pst file or add the Exchange account before removing the old account. After removing the connector account, click New to open the auto account setup dialog. If using Outlook 2007, you’ll need to select Microsoft Exchange, POP3, IMAP, or HTTP on the next screen. Type your name, email address and password in the fields. After Outlook sets the account up, restart Outlook. View or Change Existing Accounts then click Next. Select the account and click Remove. Click Add, then select IMAP and click Next. Type smtp-mail.outlook.com for the outgoing server. Now Select Use same settings as my incoming mail server. 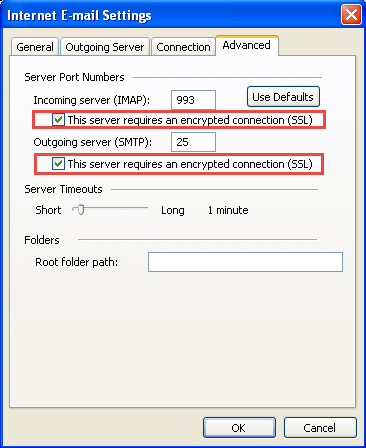 In the Incoming Server (IMAP) section select This server requires an encrypted connection (SSL). This will update the incoming port number automatically, to the correct one. In the Outgoing server (SMTP) section, select This server requires an encrypted connection (SSL). Update December 12 2015: either port 25 or 587 should work now. Click Finish and return to Outlook.